Sharing your algorithm and making it usable by non-expert users can be a lot of work. Having a financial incentive to do this work overall benefits the research community. It motivates researchers and engineers to solve problems of common interest and to do so as well as possible. With Wolution you (or your institution) earn a percentage of the price Wolution charges its users for each image he or she analyzes with your algorithm. Wolution gets the other part for user interface, computing, data storage, billing, marketing and customer service. We make sharing your algorithm easy. Wolution has a very comfortable and intuitive user interface based on modern web application technologies. 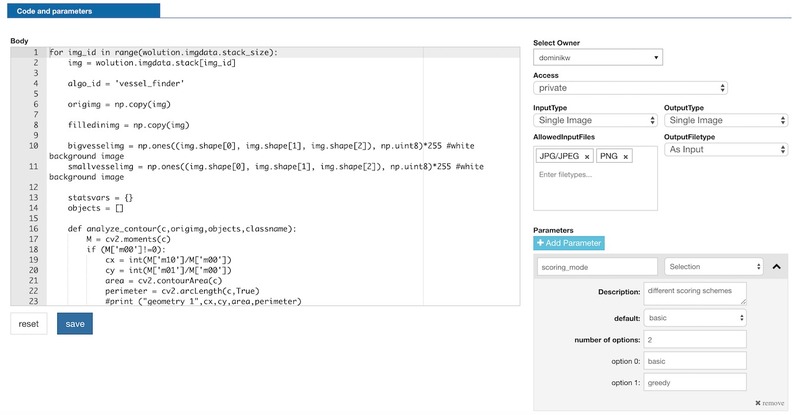 Users can adjust the parameters of algorithms, pipe them together, test them on images, and run large scale analyses of thousands of images or more. All this without any programming. Data storage and computing is done by a dynamic computing cloud that can provide massive computation power if needed by the user. If your algorithm is of Machine Learning type, it may require GPUs to run efficiently, which we also provide. A big problem in image analysis is that algorithms developed in one place often do not reach the people who could use them. This is where we come in. Our marketing team contacts potential users and informs them about their possibilities with Wolution. They will learn about your algorithms and use them if they matches their needs. Wolution bills the user for image analysis per image, depending on the total amount of images analyzed and the complexity of the algorithm. Wolution gets part of the money and the other part goes to you, the developer of the algorithm. 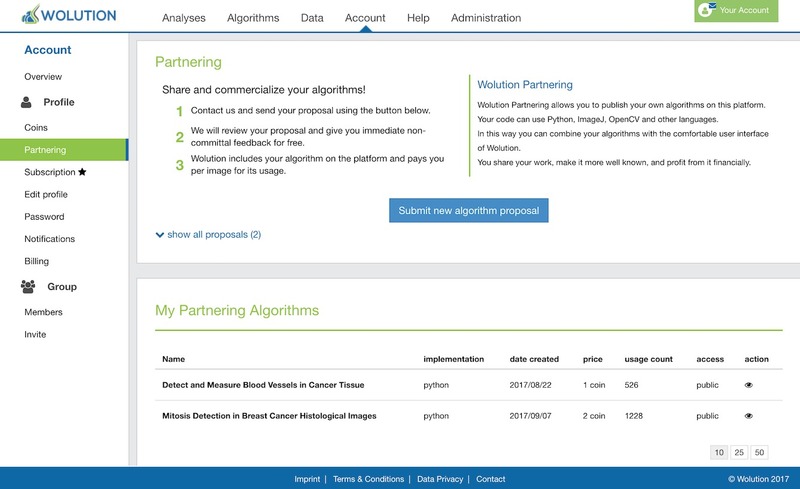 Wolution is interested in algorithms that its users, usually researchers and engineers, will find useful. Even if only a few people in the world need your algorithm, it can still be valuable to share it with Wolution. If you have created algorithms in the past that you think can be useful to other people, or if you have ideas for new algorithms, do not hesitate to contact us at contact@wolution.com. We will give you immediate non-committal feedback. If we agree to work together, you provide the code, and our team includes it in the Wolution computing engine for free.